My hypothesis was that the larger the law school, in terms of students enrolled, the more graduates it would have who are the general counsel of a Fortune 500 company. To keep the data tractable and the plot below legible, I took the 150 top-ranked schools from US News & World Report and kept only the 34 schools that have at least three such graduates (some of the GCs do not have a law school associated with them). Next, I divided that graduate number for each law school by the school’s enrollment (it is unclear as I write this whether enrollment includes LLM candidates, JSD candidates and other students aside from the standard three-year LLB or JD students). So that the numbers on the graph are not miniscule, I first divided the enrollment by 100. 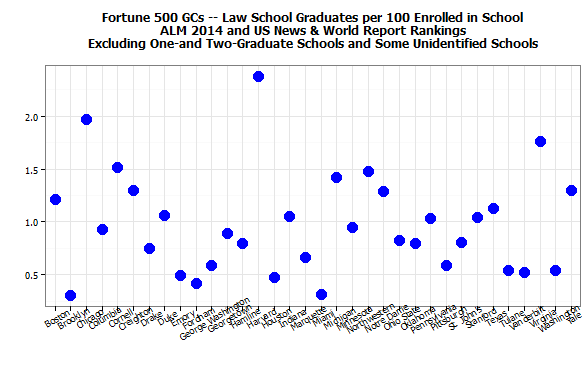 Accordingly, the chart below presents the law schools on the bottom axis in alphabetical order and their Fortune 500 GC graduates per 100 enrollees above with a blue dot. Chicago and Harvard stand highest at two or more graduates per 100. Note that the former is a very large school; the other modest. At the other end, Brooklyn and Miami are lowest at about 0.3 (meaning for every three hundred enrolled students they have produced one Fortune 500 GC graduate). My hypothesis fails, judging from the fairly random distribution of the dots.